Ah, Kyubey. The sushi empire, with a five story honten (main shop), a bekkan (annex) across the street, and branches in four luxury hotels. It is one of the most famous Tokyo sushi institutions. 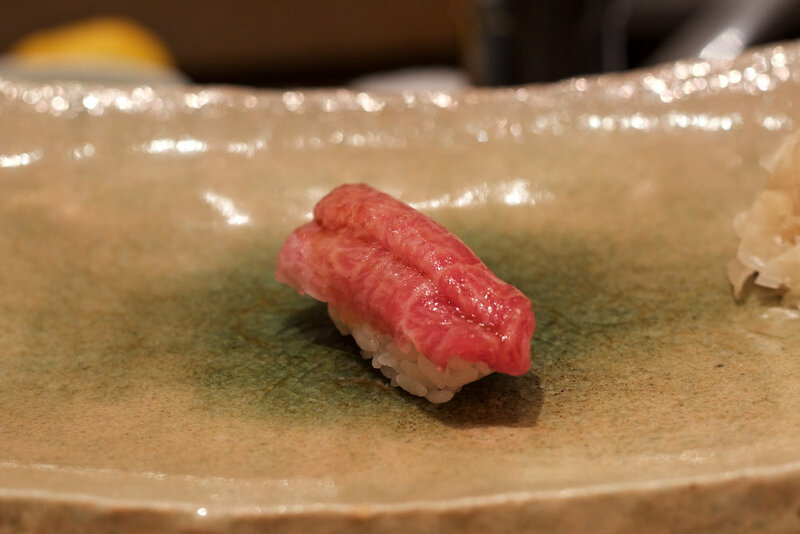 It holds a special place in my heart as the first high-end Tokyo sushi shop I ever visited, and, as such, it is still a restaurant I really enjoy going to. The shop's atmosphere is pretty unique. 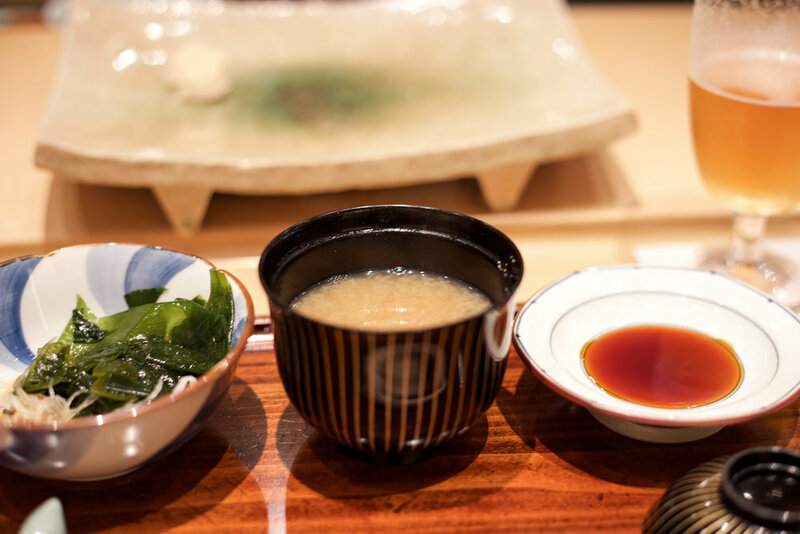 It is much larger than the typical Ginza sushiya, so its a bit louder and more boisterous. And the sushi, while not the very best in Tokyo, is still damn good. Kyubey was founded in 1935 by chef/owner Hisaji Imada, who, soon after World War II, famously invented the gunkanmaki, or warship roll, as an efficient way to serve newly popular neta such as uni and ikura. 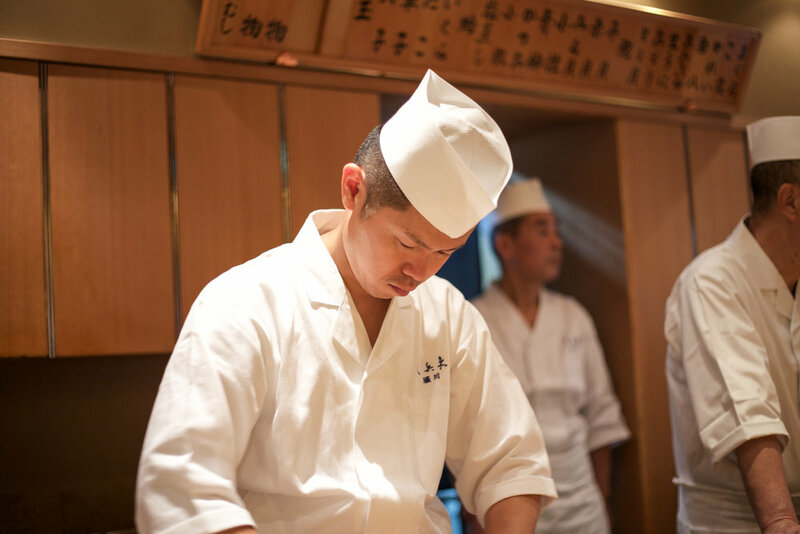 Hisaji Imada ran the establishment until his death in 1985, at which point his son, Yosuke Imada, took over as head chef. This restaurant is renowned throughout the world. It is listed in all the guide books and is frequently featured on Japanese television. The clientele is quite diverse: plenty of local Tokyoites dine here along with Japanese and international tourists. 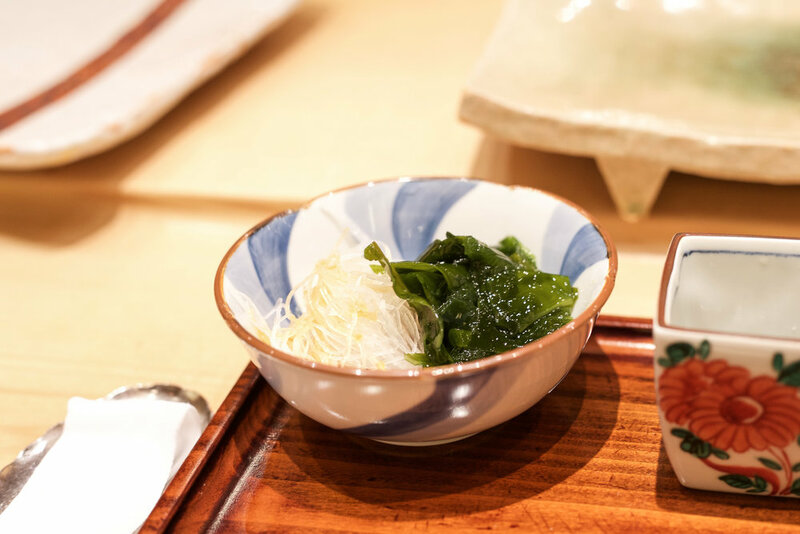 Kyubey's chefs and staff speak decent English and welcome foreign clients, so this establishment is one of the most recommended by luxury hotels in Tokyo. The quality of the food is very good, the setting convivial, and reservations are not too difficult to obtain. Walk-ins are even allowed at lunch! Hence, Kyubey tends to be a crowd pleaser. Me, I was very happy to return to Kyubey for lunch on a recent Saturday. My hotel concierge, as per my request, booked a seat at the main "F1" bar at the "honten" (head shop) location in Ginza. I decided to order the largest "nigiri only" omakase - the "Kyubey"- typically priced at ¥15,000, but discounted down to ¥13,000 due to Kyubey's ongoing anniversary celebration. My itamae, whose name I didn't catch, was very skilled, friendly, and spoke good English. The nama biru (draft beer) served at Kyubey is "Master's Dream", Suntory's premium offering. It's super refreshing and complimented the sushi well. A side dish of wakame and daikon to begin the meal. The vegetables were "all you can eat" and refilled whenever running low. First piece of sushi: a very good chu-toro. Kyubey's rice is good; seasoned with komezu (rice vinegar) and sea salt. I believe a little bit of sugar is added to the rice, although I'm not 100% sure. Personally, I prefer shari that is a touch more vinegary, but I still found the rice to be very tasty, and served at a good temperature. The nigiri pieces are slightly smaller in size than those served at more orthodox shops - which was probably a good thing considering how many I ate! Next, Isaki, (grunt) a delicate shiromi with sweet finish. Isaki is best in May and June and this piece was great. The "1F" (or first floor) sushi bar sits seventeen customers, and is staffed by four chefs plus assistants. Watching the busy action behind the bar is definitely part of the fun. Aori ika, or bigfin reef squid - a little chewy but good, sweet flavor that got more intense as I chewed on the piece. 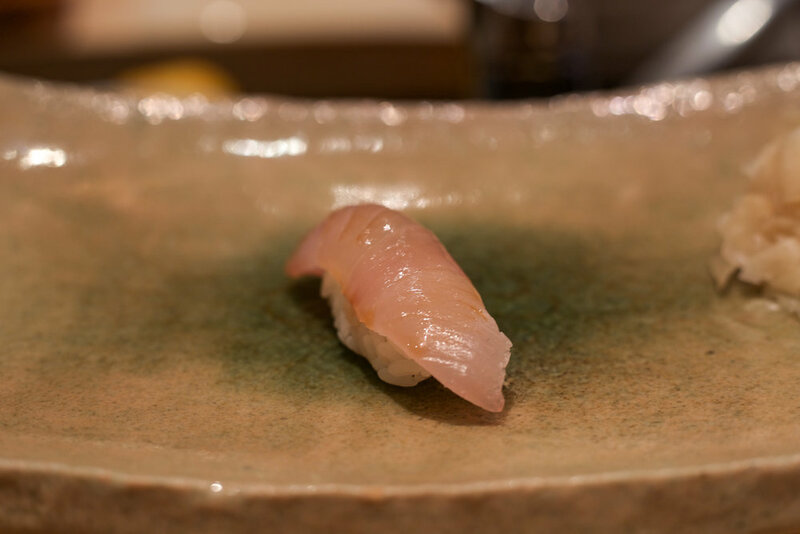 Kanpachi: very soft texture, with good depth of flavor - I'm guessing it was aged for a couple of days. Another great summertime shiromi. 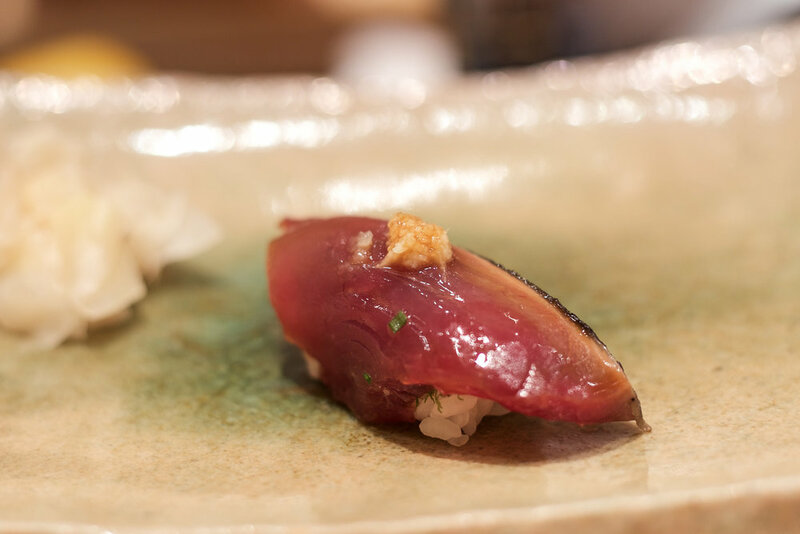 Always one of my favorites, the akami zuke (bluefin tuna marinated in soy sauce) was delicious. One of the chefs about to apply nikiri sauce to hon-maguro. 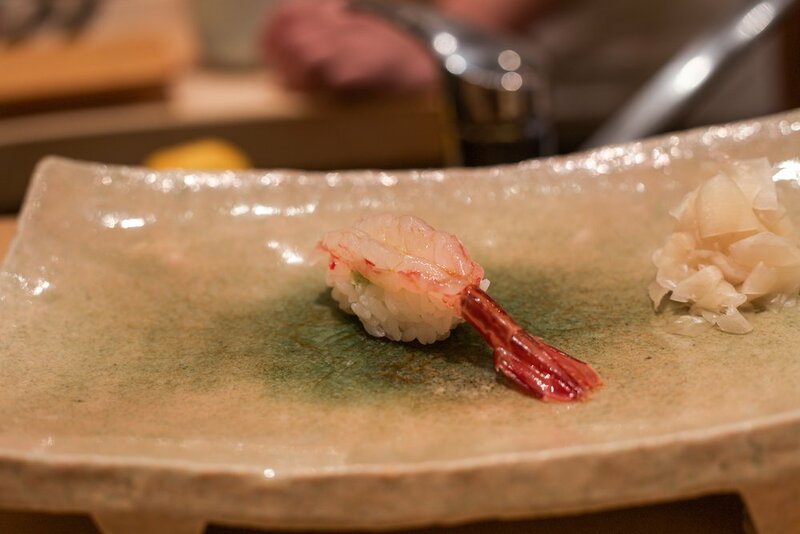 The shima ebi was incredibly fresh and flavorful. Very sweet and juicy. 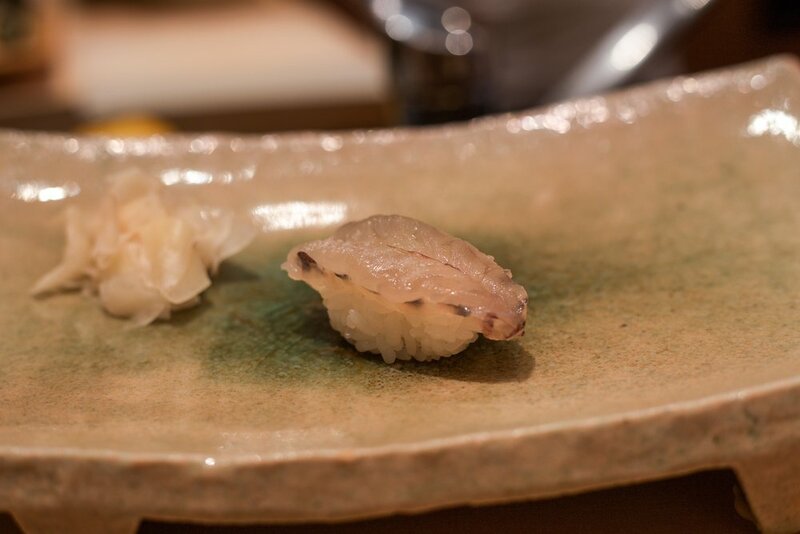 Tairagai (Japanese pen shell) is similar to hotategai, although with a crisper texture. Delicious. Murasaki (purple) uni served as gunkanmaki. It's always special to eat gunkanmaki at Kyubey knowing that it originated here. More delicious shellfish: torigai (Japanese cockle) - at peak "shun" (seasonality) now and absolutely fantastic. One of my favorites. The chefs at Kyubey love chatting and joking with customers, but they also work hard and with intense focus! Amaebi was dispatched in front of me, then offered either "nama" (raw) or cooked - as you can see from the photo, I went for the nama version. Twitching and so refreshing, with a clean, sweet flavor. Deep fried amaebi head and tail followed. Always a tasty & crunchy treat. The o-toro was very good. Nothing to write home about, but still very enjoyable. I preferred the chu-toro, but that's the case usually. The kohada was very good but not great. This is to be expected since it is not in season. 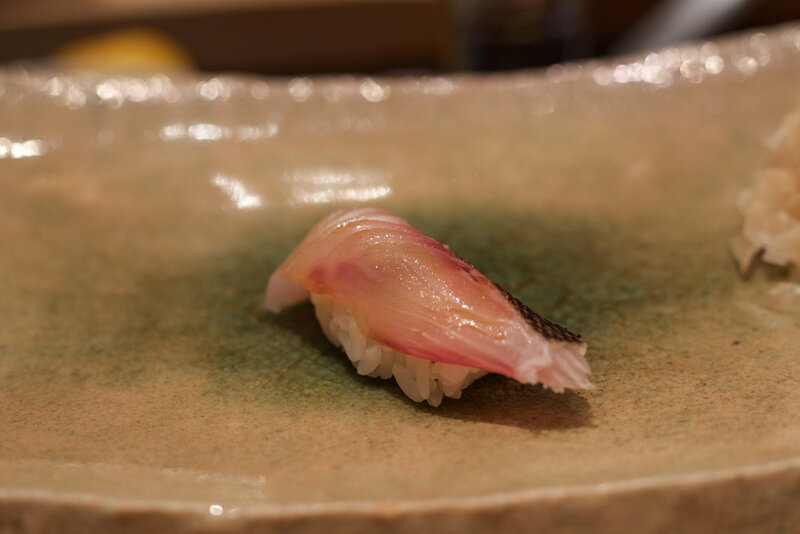 Still, kohada is my favorite tane and I was more than happy to eat this good piece. Chef bringing the next batch of live amaebi for the customers sitting next to me. Hatsu-gatsuo, or "first catch" katsuo - katsuo season having just started, this piece was delicious, and probably very expensive. Possibly my favorite of the day. Maguro aburi (seared bluefin tuna) - not exactly traditional Edomae preparation but tasty nonetheless. 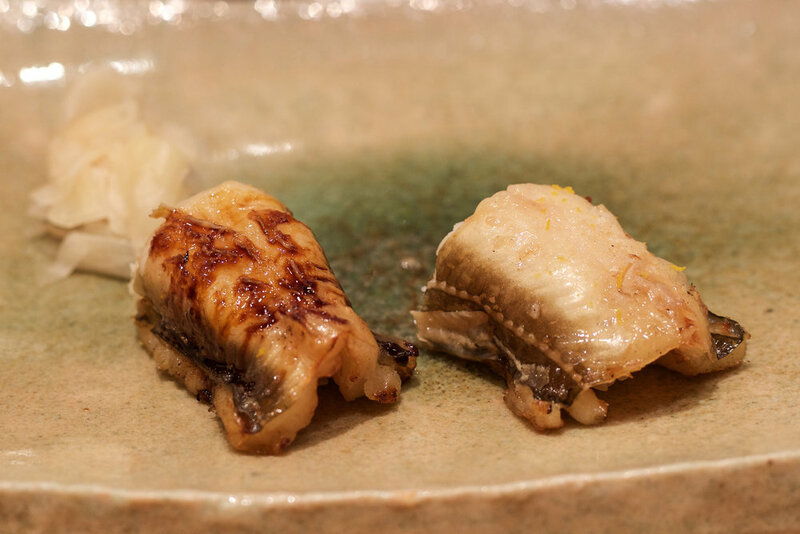 Anago two ways: with nitsume (left) and sea salt (right). Very good, but always bittersweet, as the anago's appearance indicates that the meal is coming to an end. Another itamae action shot! Holding shari in the left hand, about to apply wasabi with the right hand. A classic Kyubey amuse-bouche: shiso leaf and sesame in a daikon mini sandwich. Very refreshing. My itamae showing deep focus and concentration. Classic Edomae finish: tekka, kappa, and kampyo hosomaki. The nori was crunchy and had a good flavor. And finally, tamago. The chef asked me if I wanted it with or without rice. I asked him to pick for me. He served me both with a big smile. The tamago was good, but not particularly memorable. And so this fantastic lunch came to an end. The final bill with beers came to about ¥16,000 (about $150) - a great value considering the amount of good quality sushi consumed. I once again thoroughly enjoyed dining at Kyubey. The restaurant sometimes gets a bad rap for being too large and impersonal, but I think this criticism is unwarranted. Kyubey is not an intimate six seat counter, it offers a completely different experience. It's louder, busier, and more lively. It might not be intimate, but for this very reason it is more approachable and less intimidating to foreigners or those not accustomed to eating at serious sushi counters. The chefs are highly skilled (how many top sushi chefs apprenticed at Kyubey at some point? ), the food is delicious, and the service impeccable. 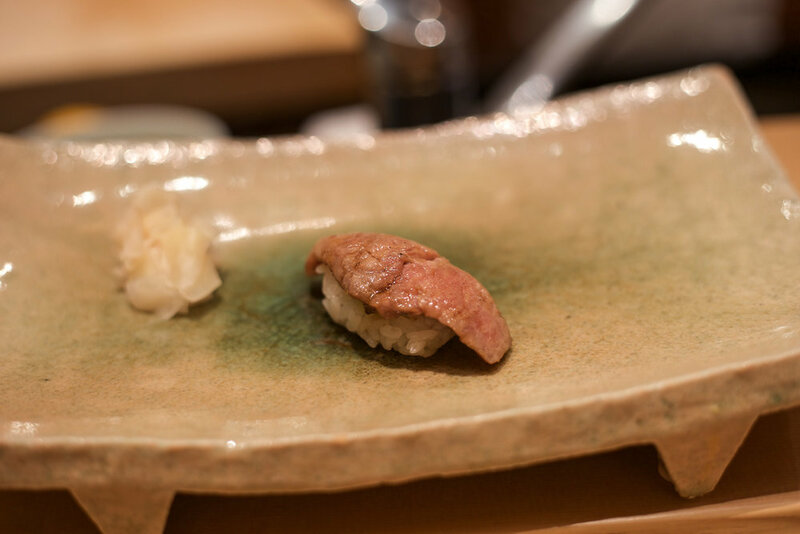 It remains one of my top recommendations for those looking for a first Tokyo sushi experience, or for anyone looking for a great lunch in Ginza.